The high level of sensitivity is realised by the Sensi-Touch® glove’s special optimised thickness, ranging from just 0.22 to 0.24 mm (single wall thickness). The glove’s textured surface ensures a secure grip on instruments in both damp and dry environments. The straight cuff ensures a secure hold on the surgical gown. 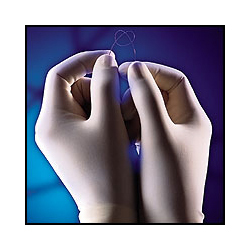 The glove’s (310mm) length is longer than a standard surgical glove, for additional protection.